Block Header A summary of the data in the block. A block header is like the metadata at the top of a block of transactions. The fields in the block header provide a unique summary of the entire block. Previous Block Hash The Block Hash of the block that this block is being built on top of. This is what "chains" the blocks together. 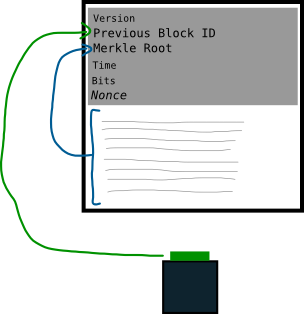 Merkle Root All of the transactions in this block, hashed together. Basically provides a single-line summary of all the transactions in this block. Time When a miner is trying to mine this block, the Unix time at which this block header is being hashed is noted within the block header itself. Bits A shortened version of the Target. Nonce The field that miners change in order to try and get a hash of the block header (a Block Hash) that is below the Target. 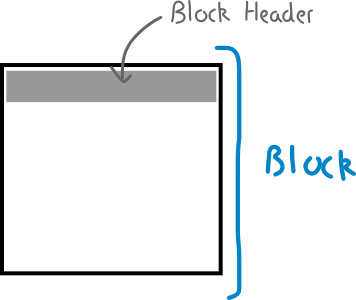 Hash Block Header - Insert individual block header fields, and get the serialized block header and the Block Hash.